Miconia canoi (Melastomataceae, Miconieae), a new species from southern Ecuador and northern Peru. Miconia canoi, a new species of Melastomataceae from northern Peru and southern Ecuador is described. Miconia canoi is similar to other scrambling or small shrubs of Miconia found in the páramos and jalcas, but can be easily identified by the combination of glabrous, ovate leaf blades without obvious secondary venation in the adaxial surface, four-merous flowers with persistent bracteoles, glandular pubescent filaments and style, and a capitate to galeate stigma. Based on anther morphology and its mode of dehiscence, M. canoi would be assigned to M. sect. Chaenopleura in the traditional sectional system for this genus. The new species is illustrated and compared to putative relatives. Se describe Miconia canoi, una nueva especie de Melastomataceae del norte del Perú y sur del Ecuador. 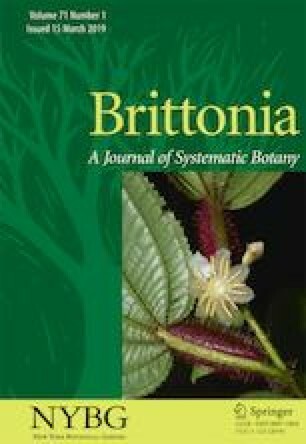 Miconia canoi es similar a otras especies postradas o rastreras de Miconia de las jalcas y páramos, pero es facilmente identificable por la combinación de hojas ovadas y glabras sin una venación secundaria obvia en la superficie abaxial, flores tetrameras con bracteolas persistentes, filamentos y estilos glandular pubescentes y el estigma capitado a galeado. Basados en la morfología de la antera y su modo de dehiscencia, M. canoi sería asignada a M. sec. Chaenopleura en la división seccional tradicional del género. Se ilustra la nueva especie y se compara con especies putativamente relacionadas. This work was supported by the National Science Foundation through the PBI-Miconieae project (DEB-0818399). We are very grateful to the staff of the following herbaria for access to their collections: BM, F, K, MO, NY, US, and especially USM. We also need to thank Maria Gavrutenko for her support during fieldwork, Bobby Angell for the delightful line drawing, Liz Kiernan for the distribution map, Diana Fernández for digital images of specimens at the QCNE herbarium, Renato Goldenberg and Carmen Ulloa for comments on an earlier version of this manuscript, and the Ministerio de Agricultura y Riego of Peru for the collecting permit (Resolución de Dirección General 079-2016-SERFOR/DGGSPFFS). Thiers, B. 2017 (and continuously updated). Index Herbariorum: A global directory of public herbaria and associated staff. New York Botanical Garden's Virtual Herbarium. http://sweetgum.nybg.org/science/ih/.